The Scherer is a traditional, family-run 4-star hotel in a quiet residential area, only a 15-minute walk along the Salzach River from Salzburg’s Old Town. The modern rooms provide individually controllable air conditioning, flat-screen satellite TV, a minibar, and a bathroom with hairdryer. The restaurant serves traditional Austrian cuisine and a rich and varied breakfast buffet, available daily from 06:30. In summer, guests can dine outdoors. The bar is open 24 hours. 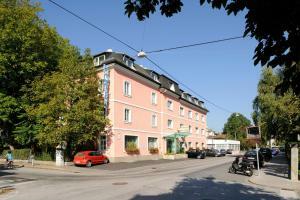 Hotel Scherer also features a 24-hour reception and a bicycle rental. Garage parking is available at an additional cost. The Haunspergstraße Bus Stop is only 70 metres away from Hotel Scherer, providing direct connections to the city centre in less than 10 minutes. Salzburg Main Train Station is 400 metres away, and the Salzburg Congress Centre is 600 metres away.